This recipe is a great way to get your fill of plump, summer-ripe tomatoes. These tomatoes are stuffed with a mixture of quinoa and ground turkey, but to make them vegetarian, read the variation at the end of the recipe, which substitutes meatless crumbles for the turkey. Quinoa is a nutrient-packed grain that can be found in the rice and grains section (or the bulk section) of your local supermarket or natural foods store. This recipe makes extra quinoa stuffing, which you can either pass at the table, or you can freeze and use at a later point for stuffing more tomatoes or bell peppers. Rinse quinoa well in a finely meshed colander under cool running water. Place rinsed quinoa in a saucepan and add the chicken or vegetable stock. Bring to a boil over medium-high heat and then reduce heat and simmer, uncovered, for 15 to 20 minutes or until the quinoa has absorbed all the liquid and is tender and fluffy. Meanwhile, slice the tops off the tomatoes and remove core, seeds and pulp. Slice a tiny piece off the bottom of each tomato to give it a flat base on which to stand. Sprinkle the insides of the tomatoes lightly with salt and place upside down on a wire rack set over a sheet pan. In a large nonstick pan (One to try: Swiss Diamond), heat olive oil over medium-high heat, tilting pan to coat. Add onion and cook, stirring occasionally, until onion is softened and starting to turn golden, about 5 minutes. Add red pepper and saute, stirring occasionally, for another 5 minutes. Add ground turkey and cook, stirring and breaking up larger pieces with a wooden spoon or spatula, until turkey is completely browned and cooked through. Remove pan from heat, stir in cooked quinoa and fresh parsley. Season to taste with salt and pepper. Preheat the oven broiler. Remove tomatoes from the wire rack and wipe sheet pan clean. Line sheet pan with a piece of parchment paper or aluminum foil. Stuff each tomato with quinoa mixture, packing the mixture so the tomatoes hold as much filling as possible. Place each tomato on the lined sheet pan, and top each with a generous layer of cheese. Place tomatoes under the broiler, checking after a few minutes, until cheese is melted and bubbly. 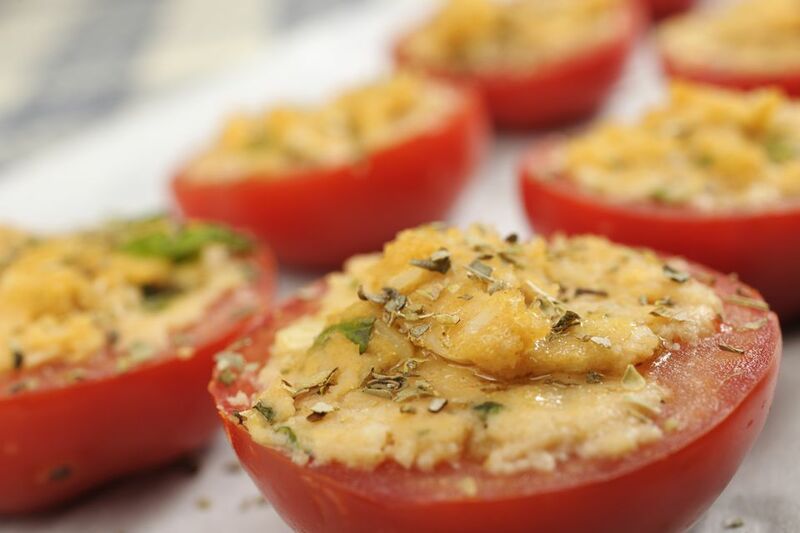 Vegetarian Variation: To make a meatless version of these tomatoes, use vegetable broth in step 1 to cook the quinoa. In step 2, use 1 pound frozen meatless crumbles (such as Boca Ground Crumbles or Quorn Grounds instead of the ground turkey and saute until the crumbles are heated through. Proceed with rest of the recipe as directed.